I’m a bit biased when it comes to Ron Burgundy and his Channel 4 news team. But can you blame me? The first movie was a super hit back in 2004 and it made an even bigger star out of Will Ferrell. A decade later and Ferrell is still the go-to guy if you want to laugh yourself silly. It’s a shame that we had to wait so long for this sequel but now that it’s here I can safely say that it plays exactly like the first one. I’m not kidding. Director and co-writer Adam McKay moved the plot from the 70’s to 1980, where Ron and his crew are trying to revive their careers by joining a 24 hour news channel called GNN (I’m serious). I’m not going to spoil the jokes by telling you what these morons will do. But I can tell you that Ferrell is lucky to be surrounded by some of the best actors in the business, including David Koechner as Champ Kind, Paul Rudd as field reporter Brian Fantana and Steve Carell, as Brick Tamland, the weatherman of more than usual stupidity. If you sense the presence of recycled jokes from the first film, you’d be right. But you’d be wrong to discount the comic rapport Ferrell has with his team. There’s no sense to the scene in which the boys get together to discuss different types of condoms; it’s just pure pleasure to watch.The cameos from the likes of Harrison Ford, Will Smith, Jim Carrey, Liam Neeson and Vince Vaughn are priceless. 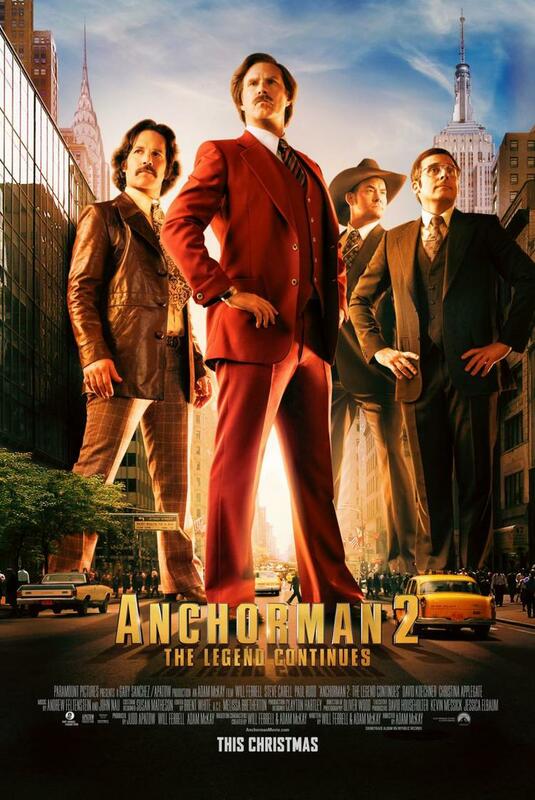 But “Anchorman 2”, that rare Ferrell film in which he doesn’t get naked, is hard to resist. Ron is even funny trying to convince his now ex wife Veronica (Christina Applegate) that their 7 year old son could be “a midget with a learning disability”. Stay classy, Burgundy.